Join CIPA and other writers and publishing groups at “Get Connected! 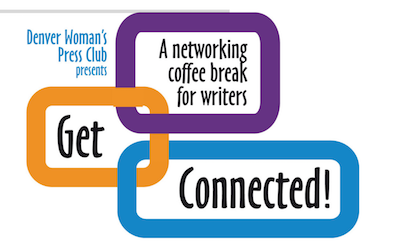 A Networking Coffee Break for Writers”, presented by the Denver Woman’s Press Club on Saturday, April 9, 2 to 5 p.m. The event includes services for writers, short presentations, entertainment, and resources. The event is designed to encourage creativity, collaboration, and mutual support. “Get Connected!” will be held at Rocky Mountain PBS, 1089 Bannock St., Denver. Goodies and coffee are included with registration, which is $20 in advance and $25 at the door. Free parking is provided. To register or for more information, contact www.dwpconline.org, or call DWPC, 303-839-1519.